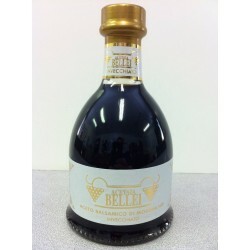 BELL GOLD Balsamic Vinegar of Modena PGI represents the quality of our most aged vinegar. Aged for years in oak barrels, it is distinguished by its high density, it has the typical barrique well-balanced and harmonious aroma and a sweet flavor with a slight acidity. This aged vinegar is recommended for grilled meat, boiled vegetables, Parmesan cheese, vanilla ice cream or as condiment for strawberries. BEST WITH: Grilled meat, boiled vegetables, Parmesan cheese, vanilla ice cream or as condiment for strawberries! Only natural ingredients! No preservatives, no addtives, no artificial flavor or color.